The night was sentimental, but the competition was cutthroat! For Dance-Off week on Dancing With the Stars, the seven remaining couples performed routines dedicated to important people in the stars&apos; lives. Emotions were high — not only because each dance held such personal meaning, but also because in addition to the usual points and votes, the pairs were competing for immunity. Here&apos;s how it worked: The highest scoring couple received immunity for the week plus an extra three points added to their score in advance of the next elimination. Meanwhile, the other six couples competed in toe-to-toe dance-offs voted on by the three judges plus viewers at home. The winning pair from each of those received two extra points to add to their scores. Get all that? Good. Now, here&apos;s how it all went down. Nick Carter dedicated his contemporary dance to his wife, Lauren (who&apos;s now 16 weeks pregnant with the couple&apos;s first child). The emotional story behind their dance brought out the best in Nick, and he and partner Sharna Burgess delivered a perfect routine. Bruno Tonioli called it "poetry" and Carrie Ann Inaba was brought to tears. After the performance, Nick learned that he and Lauren are having a boy — and that he Sharna received a perfect score, which ultimately gave them the most coveted prize of the night: immunity! In a rather unexpected twist, Bindi Irwin chose Grace Kelly (not her late father) as her icon. As usual, she and Derek Hough pretty much nailed the routine, despite the fact that Bindi&apos;s toenails are literally falling off from so much practice. The crowd loved the performance, and so did the judges. Though Julianne Hough picked on the teen&apos;s posture a bit, she also admitted that she was actively trying to find something (anything!) wrong to point out. After receiving her 28, the audience booed and Bindi — in true Bindi form — vowed with a smile, "I will be better next week!" After last week&apos;s fall to the bottom, Tamar Braxton lifted herself back up. 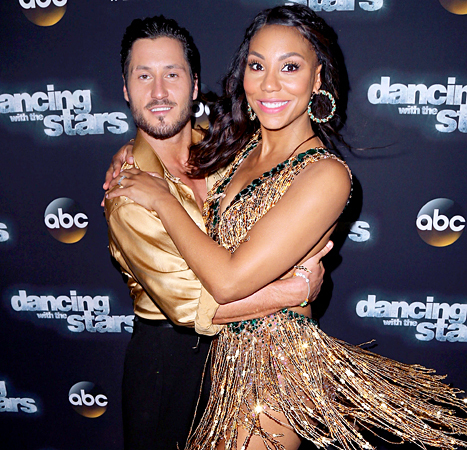 In their video package, Val Chmerkovskiy was upset that "every week" Tamar was portrayed as "obnoxiously arrogant." Tamar confessed that the reason she keeps saying she&apos;s such a great dancer is actually because she has self-esteem issues and needs positive reassurance in order to push forward. She chose her sister, Toni Braxton, as her idol and that, combined with support from Val, seemed to help her find her groove. Carrie Ann took the couple to task for an unauthorized lift (a big no-no in the paso doble), but overall the judges were impressed and rewarded The Real host with some of the highest scores of the night. Carlos PenaVega and Witney Carson hit the floor hard with a salsa that paid tribute to Marc Anthony and wowed the judges. "You were tossing Witney into positions that you cannot even find in the Kama Sutra," Bruno declared. Carrie Ann pointed out a lift went wrong, but it didn&apos;t matter because the pair "had such an incredible connection." But things didn&apos;t go smoothly for everyone. Alek Skarlatos opened up about his struggle to see himself as a hero, but seemed more comfortable in his own skin dancing a contemporary routine in honor of his own hero, the late Chris Kyle. Bruno praised him for taking on difficult lifts, but Julianne wished pro Lindsay Arnold had included more side-by-side choreography. Alexa PenaVega turned to her faith for inspiration, dancing an Argentine tango with Mark Ballas inspired by the Biblical story of David and Goliath. Everything started well with Mark utilizing a big screen to set the stage, but in the middle Alexa missed a few steps, which had the judges (figuratively) pulling their hair out. She and Mark still did okay, but they missed what could have been a huge score. Finally, after a strong showing during Halloween Week, Andy Grammer struggled again. Despite dedicating the dance to Grammer&apos;s late mother and performing to a song by his icon, Stevie Wonder, the chart-topping singer and partner Allison Holker fell flat. The judges connected with his emotion, but couldn&apos;t get past his technical flaws. Once the individual routines were complete, it was (finally) time for the dance-offs. Bindi and Derek danced the jive against Carlos and Witney. Voters at home thought Bindi and Derek stole the show, but the judges disagreed, and Carlos and Witney nabbed the two extra points. Tamar and Val then went up against Alexa and Mark in the cha-cha. Judges were split on which couple won, but the voters at home pushed Alexa and Mark to victory. Finishing up the competition for the evening, Andy and Allison danced the samba against Alek and Witney. By unanimous vote from all three judges and the home voters, Andy and Allison won. But those bonus points aren&apos;t going to do Andy much good because moments after winning them, he found out he was eliminated. "It&apos;s actually kind of fitting that I would leave tonight after really getting to honor [my mom] through dance," he said. "And I&apos;m going out on a handspring!" He then busted out a handspring and the worm, which makes him a winner in our book. Tell Us: Did the right couple get eliminated?